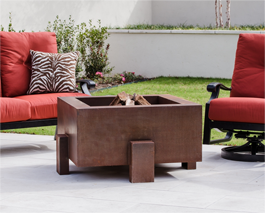 Designed for maximum durability, our collection of Texas-made wood burning fire pits are constructed of 11 gauge Cor-Ten steel and stainless steel. Each fire pit includes a clean out vent and a expanded metal removable wood grate. The fire bowl is 14 inches deep with the wood grate positioned 5 inches from the bottom of the fire bowl. An optional fire bowl cover is also available.